Citation: C N Trueman "Josef Tito"
Josef Tito was born in 1892 and died in 1980. During World War Two, Tito found fame as a resistanceleader in what was Yugoslavia. Loyalty to Tito was immense – even a reward of 100,000 Reichsmarks offered by the Nazis did not tempt his followers to betray him. Tito was born in Kumrovec in Croatia. His was born as Josef Broz and served with the Austrian infantry during World War One. He became a sergeant-major but was wounded and captured by the Russians in the Carpathians in 1915. By midsummer 1917, Tito had escaped and joined Russian revolutionaries in St Petersburg. He subsequently joined the ‘red’s and fought against the ‘Whites’ during the Russian Civil War. After the Russian Civil War, he returned to Croatia and found work in Zagreb as a metal worker. He joined the illegal Yugoslavian Communist Party but in 1928 he was arrested by the police and sentenced to six years in prison. After his release from prison, Tito still remained with the party and visited Moscow in 1935, 1938 and 1939. In the summer of 1937, Tito was appointed general-secretary of the Yugoslav Communist Party. It was now that he changed his surname from Broz to Tito. In 1941, the Germans invaded Yugoslavia. In June, Tito made his way to southern Serbia where he took control of the resistance movement. He and his movement were very successful and a constant thorn in the side of the Nazis in Yugoslavia. Not even fearful retaliation against the civilian population of Yugoslavia did anything to stop what the partisans did. Those who were led by him gave him the title ‘Marshall of Yugoslavia’ in November 1943. It was a title that became internationally recognised. On May 24th 1944, the Germans launched a major attack against his headquarters at Drvar. Tito narrowly escaped capture and death. 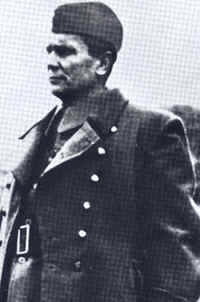 By the time the Nazis were driven out of Yugoslavia, Tito was the undisputed head of state. After the war, Tito had the self-confidence in his international status to defy Joseph Stalin. The Soviet leader naturally expected all eastern European states to accept and adopt Soviet rule – or have it imposed on them. Tito was not prepared to accept this. He had not fought against one foreign occupier to simply allow another one to take its place. This stand against such a hugely powerful neighbour as Russia, increased Tito’s status and prestige amongst his own people. In January 1953, Tito was elected President. He was re-elected a further five times and in 1974 was created president for life. On two occasions, Tito publically criticised the Soviet government. One was in 1956 when Russian tanks rolled into Hungary and the other was in 1968 when a similar thing happened to Czechoslovakia. Tito died in May 1980. Despite the Cold War being at its height, world leaders flew in to Belgrade to pay their respects – 3 kings, thirty-one heads of state and sixteen prime ministers.